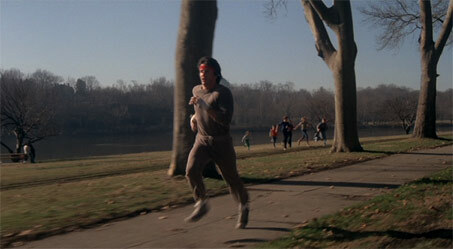 How Far Did Rocky Go in His Training Run in ‘Rocky II’? 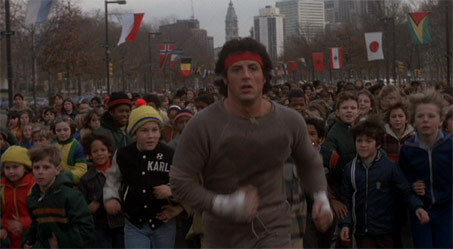 One of my favorite parts of any Rocky movie is the training montage. Specifically, I enjoy watching Rocky run the streets of Philadelphia (I and II) or on the beach (III) or in the snow (IV) or whatever happened in the fifth movie I’ve erased from my memories. 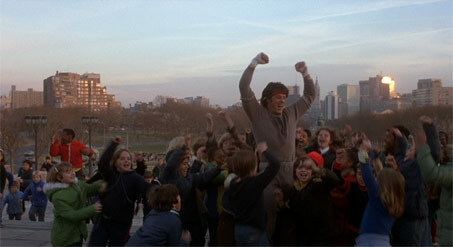 Of all the Rocky training montages, though, the run in Rocky II is my favorite. But, I wondered, what if this roadwork were treated as one actual run? How far would Rocky go? Well, I decided to find out. I pieced together the routes Rocky could have traveled from scene to scene in this training montage and calculated distance. All distances were mapped out by using the USA Track and Field distance-measuring tool recommended to me by my friend and Philadelphia magazine managing editor Annie Monjar. She’s a better runner than I am, so I trust her. 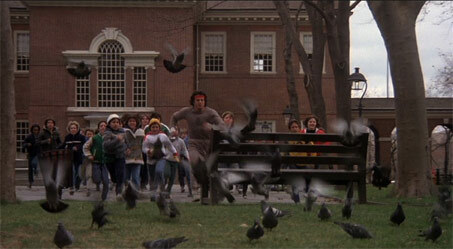 However, I’m not sure she could take Rocky in a footrace, at least Rocky II-era Rocky. Let’s see how far he went. In the second film, Rocky marries Adrian and they move to a house in South Philadelphia’s Girard Estates section, a home that was recently up for sale. 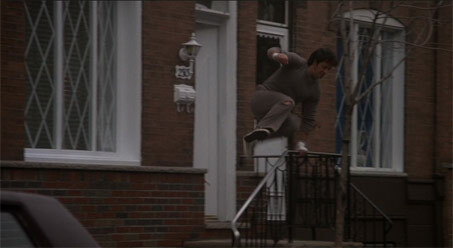 Rocky begins his run with a leap off the porch and over the railing. So far, so good. Yeah, so Rocky goes from deep South Philly to… running on the train tracks adjacent to Lehigh Avenue on the Richmond/Fishtown/Kensington border! Not so safe, and also incredibly far from South Philly. Here’s the route I imagined Rocky took: His house on Lambert to Passyunk, which he took all the way down to South Street. Then Fourth to Callowhill to Delaware Avenue (It wasn’t Columbus Boulevard then!) Delaware Avenue to Beach Street to Richmond to Schirra and back to Beach, which dead ends to a spot to sneak on to the train tracks. (Today, all the tracks have been removed except one.) 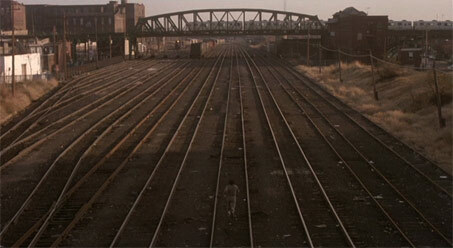 Rocky runs on the tracks until the bridge on Kensington Ave that carries the El. He exits shortly down onto East Gurney Street, where at least today there is a seemingly good spot to leave. One great aspect of being Rocky is the train engineers merely say “Go Rocky!” instead of “Get the hell out of here before I call the cops! Sure, pass by the Italian Market when you’re just a few feet away from it, then double all the way back from Kensington to run through it again. I figure Rocky exited at East Gurney, took East Sterner to Lehigh Avenue, which he took to Broad. Then it’s a quick run down Broad to Washington to 10th to League to Ninth Street, where Rocky is greeted by cheering fans—and a flaming barrel, obviously. Nothing is more South Philly than a flaming barrel. Yes, that’s right: Now Rocky is back up here, just a bit west of where he ran the train tracks earlier. How’d he get there? I’m thinking he went down 9th to Callowhill to Front to Somerset back to Front to Tusculum to B Street at Gurney. 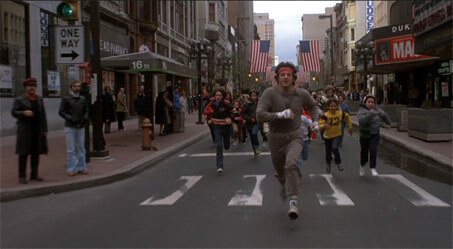 Why didn’t Rocky just do this part of his run while he was already up in the area? I don’t know. 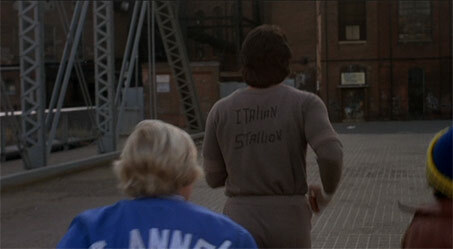 Why did he write “Italian Stallion” on the back of his sweatsuit without putting much effort into it? It is at this time that Rocky starts picking up neighborhood children who are following him during his run. Keep in mind the shape these children must be in when you see the final distance total. 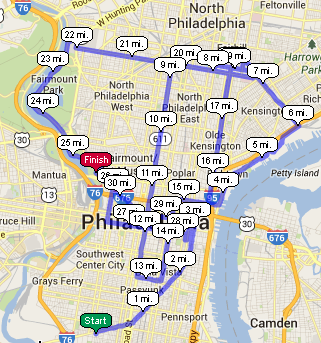 This exercise has made me appreciate just how enormous Philadelphia really is. All the way from Kensington to Kelly Drive? Who would do such a thing on a run? Rocky crosses the B Street Bridge, takes it to Gurney to Somerset to Fifth to Lehigh all the way to Ridge to West Hunting Park to Kelly Drive. 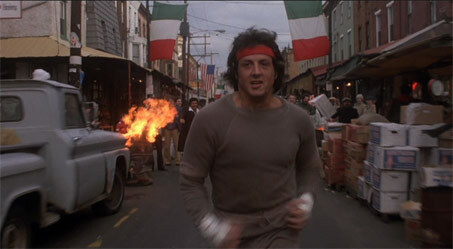 Now, I know what you’re thinking: Might Rocky have to run through a scary cars-only tunnel on Hunting Park at the end? No one would actually do that, even a prizefighter. Well. Here are two runnners — in racing tank tops, too, maybe? 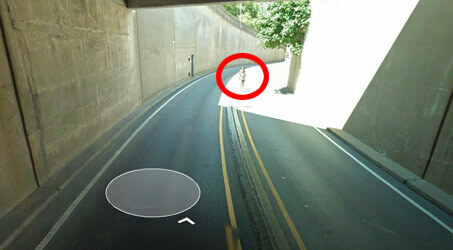 — caught on Google Street View running through the tunnel! If they can do it now, Rocky could have done it in 1979. We’ll extend this Kelly Drive run all the way to back of the Art Museum. You’d think Rocky — who earlier was running on train tracks — is just throwing caution to the wind again and running in the middle of Chestnut Street. But Chestnut had been closed to traffic from 18th to 8th in 1976, so this is actually pretty boring compared to the previous parts of his run. I enjoy how Rocky has yet to let any child pass him. He takes the Ben Franklin Parkway to 22nd to Chestnut and heads down to 15th Street. Rocky continues down Chestnut Street and runs through Independence Hall — before post-9/11 security measures, you could do this — and out onto the back courtyard. 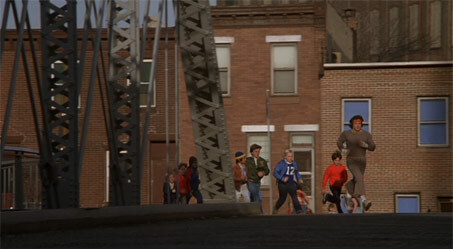 This scene is the source of the title for the entertaining documentary Rocky Jumped a Park Bench, which chronicles the places in Philadelphia used in the filming of the Rocky movies. Did the kids jump the bench, too? These are some in-shape kids! Why didn’t these kids become track stars in the ’80s and ’90s? And where are their parents? Is this why Philadelphia was so screwed up in the ’70s? Rocky’s run ends here, obviously. He goes through the Independence Hall backyard to Walnut to Fifth to Arch to the Parkway and all the way up the Art Museum steps. I enjoy how he actually sprints away from his Pied Piper-like following at the end of this run, making sure they know that he’s the professional athlete here and not them. And look how much energy he has left after his monster run! Top boxers usually do a lot of roadwork to increase stamina; the LetsRun forum says Kelly Pavlik once won an award in a 10K the week of a fight. Ali ran about three miles every workout, per Norman Mailer’s book. An episode of 24/7 showed Floyd Mayweather running an 8-miler. But this? This is ridiculous. Over 30 and a half miles. Rocky almost did a 50K. No wonder he won the rematch against Apollo! To help you understand exactly how much distance Rocky covered, I saved Rocky’s running route at the USATF site. This is one long run. I don’t recommend anyone try it. But if you do, be sure to have a gaggle of children with you—and make sure you’re fresh enough to celebrate at the end. Big thanks to the people who helped me identify some of the locations in the montage: Brad Maule, Andy Cliver, Sandy Smith, Bryan Graham, Tom Dougherty and Brian Howard.